I haven't been to the grocery store in a few weeks. Honestly, when I go I stick to a pretty set list complete with ingredients for the upcoming weeks meals, as well as a few snack items. So, once all those meals are made and the leftovers are eaten, we basically have nothing in our fridge except frozen veggies, chicken, cheese and pasta. This week has been one of those weeks where the ingredients have started to dwindle and we're left with a few random things to throw together into a meal. 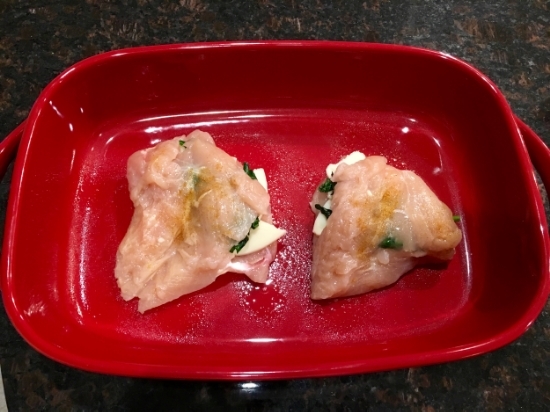 I found a quick and easy stuffed chicken recipe on Pinterest and seeing as it only called for three true ingredients, I declared it our meal for the night! It's probably one of the easiest meals I've made. Prep time was about 5 minutes and the bake time was only around 30. I cut it short at 25 because I could tell the chicken was cooked through. 2. In a large frying pan, add olive oil and garlic and sauté over medium heat for 1 to 2 minutes. 3. Add the Spinach and stir until wilted and cooked. Will probably take about 2 to 3 minutes.
. Butterfly the chicken breasts lengthwise down the middle, but not all the way through. The top portion should be like a flap. 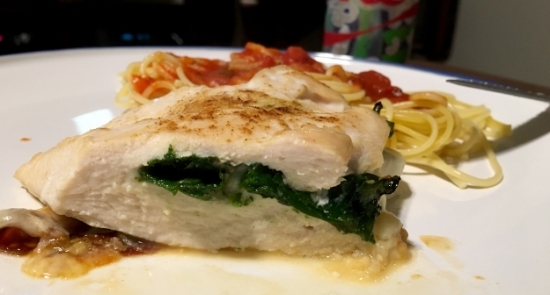 5.Place a slice of Provolone cheese on each chicken breast. Then, add the sautéed spinach on top of the cheese.
. Fold the chicken in half like a sandwich to keep the stuffing in. 7. Place the chicken on a greased baking dish and top with paprika. 8. Bake uncovered for 25 to 30 minutes. Here are my comments about the recipe... I thought 4 cloves of garlic was a lot, so I did 2, but I really think 1 would have done. The spinach was overpowered by the garlic taste, which I could have done without. Definitely could have toned down the garlic a bit. Plus, I felt like a garlic dragon breathing deadly garlic breath for the rest of the night! I paired the meal with a bit of pasta with tomato sauce because I knew J and I needed a "side" to fill us up. Overall, this recipe was a great, last-minute, "last ingredients" type of dish. 36 days until THE DAY!